The Practice Manager has versions specifically designed for Family Medicine, Surgery, Ophthalmology and Optometry, Anesthesia, Ambulance, Surgery Centers, Dialysis, and Rural Health clinics. 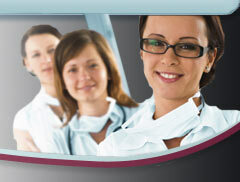 Electronic Claims submission to localized Medicare, Medicaid, BCBS carriers with no per claim fee. Electronic posting of Medicare Remittance Advice to individual patient accounts. Automatic Resubmission of unpaid claims after 60 and 90 days, and transfer of the balance to patient due at 120 days. Electronic Patient Statement processing for as little as 63 cents per statement, including forms, envelopes, and postage. A complete library of financial reports, and a custom reports module that exports all of the system's data to Microsoft Access. To take a quick tour of our medical billing solutions; including Medical Billing, and specialty software for Ambulance or Anesthesia billing click here.